I’m really excited about the Milgard aluminum windows I picked out for this house and have to say I’ve removed tons of aluminum windows but this is the first time I’ve ever put them In. They are a modern energy efficient version of what we took out. With my right hand man Barney, we got them all installed including the 6 foot and 8 foot patio doors in a day and a half. 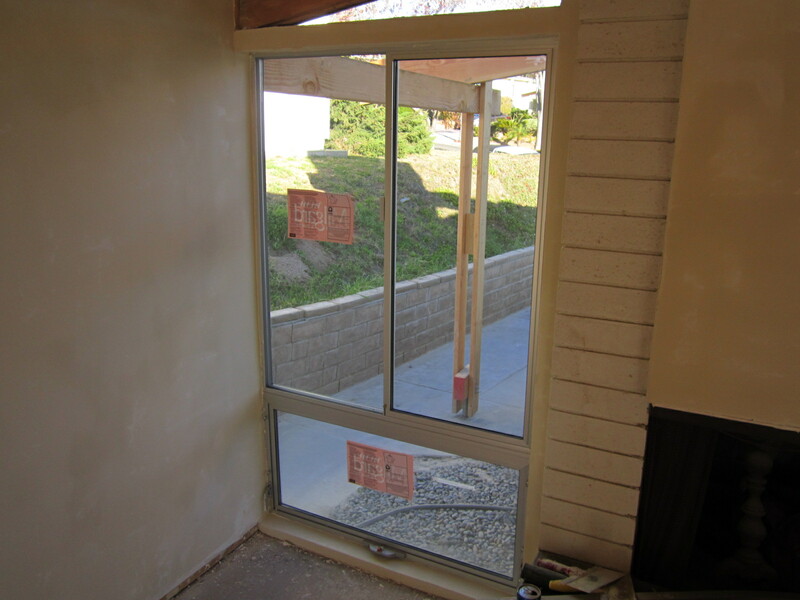 These are new construction windows meaning you have to break the stucco back to install them using nailing fins. Putting them in is easy but the most important part is getting new flashing behind the old felt paper and using Jiffy Seal around them for a good seal. When breaking out your old ones try not to damage the wire mesh or felt paper. There’s a lot of guys flipping houses in San Diego and throwing in retrofit or vinyl lip windows. 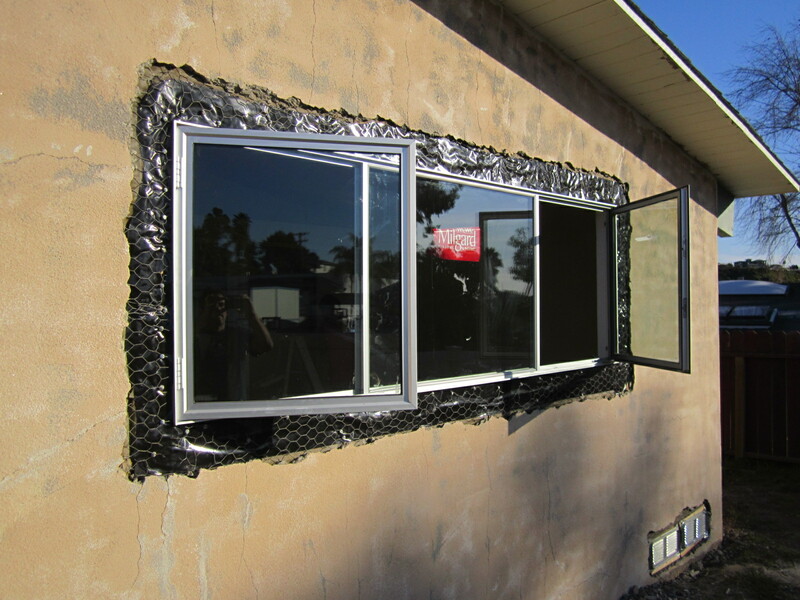 Believe me, you don’t want to put in vinyl retrofit windows, they will not hold air and warp in less than 10 years. I know because I have them in my house! For our Mid Century project I wanted to get the stream-lined modern minimalist look so the aluminum was a clear choice. I wanted to use a mixture of casement and awning windows on this project so the master bedroom window was a perfect candidate to replace the old huge slider with a fixed window and 2 casements on the sides. 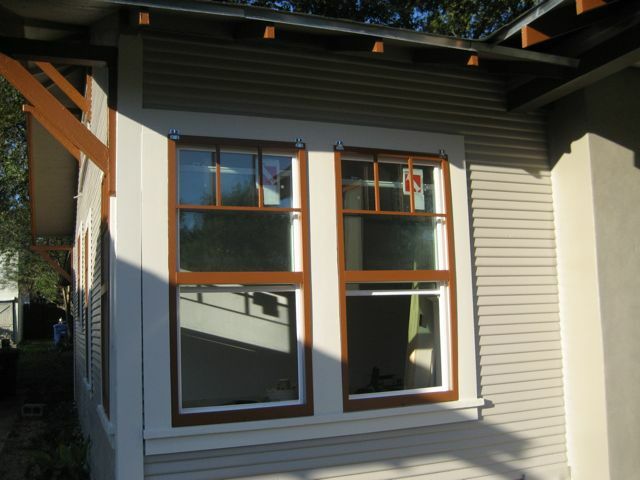 I was able to put together a custom front window also with an awning on the bottom and slider on the top as seen here. I almost went with a really cool look – triple awning on the front, but thought there might not be enough air flow on those hot San Diego summer nights with no A/C so I played it functionally safe and put sliders in the secondary bedrooms as well. Since we are re-stuccoing the whole house I also took this opportunity to break out and replace all the old crawl space vents as you can see at the bottom of the top picture. After price shopping around at 4 places I ended up getting the best deal at Home Depot. 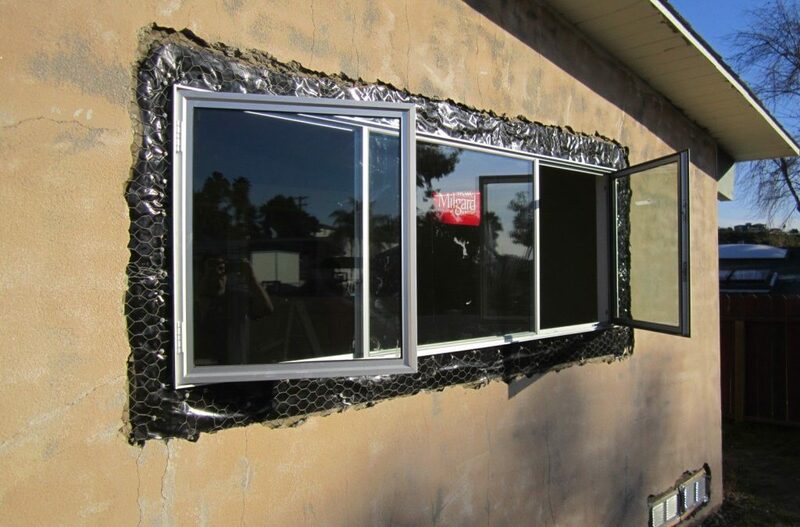 These are special order windows and take 3-4 weeks to arrive so you want to order them as soon as possible so they don’t slow your project down. For orders over $2500 you can request special pricing from the Home Depot Bid Room. Just ask to do so at the Millworks or Contractors desk. In my case they knocked off another 14% and with no delivery charge I ended up paying about $3600 for all the windows including a 6 foot and 8 foot patio door. 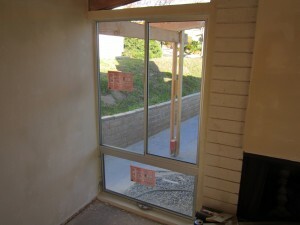 These windows are of course low E and dual pane. The patio doors were a little more tricky because the frames come in 4 pieces but easy for anyone to do and they installed like a dream. They shut so good it sounds like an airplane door. I tried out a new drywall patching crew this time and am super happy with the results. They cut out everything square, patched all my Swiss cheese holes from running the mechanicals, and then skim coated the entire house with a new 90% smooth texture. 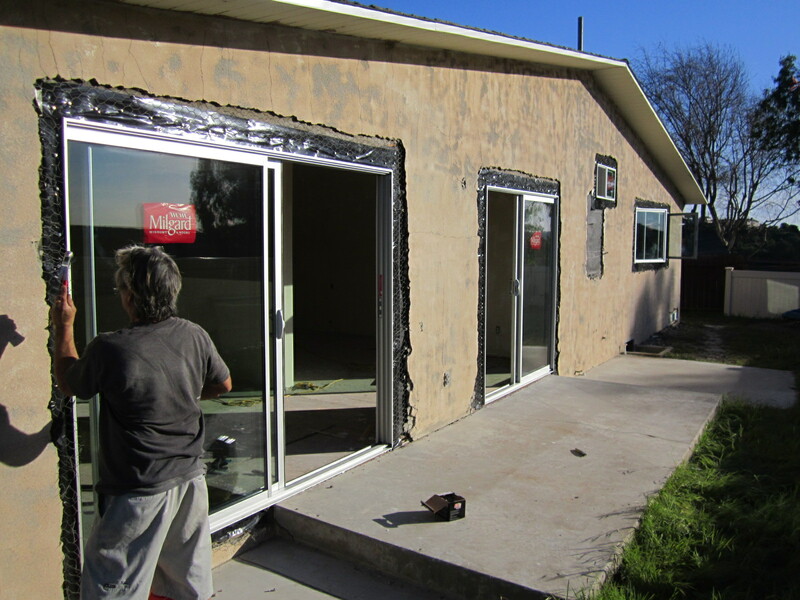 They also had to redo some of the window and door returns from our install, so it was nice to have them there fixing stuff as we were putting in the windows. The inside is ready for paint now, everything is really going smooth with this house. 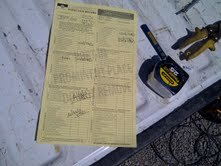 I’m off to the recycle yard with the old aluminum windows now for a nice bonus check for helping the environment! I had a productive week starting out by hanging all the OSB plywood on the room addition exterior, it really starts looking like a house once it has something on the framing. 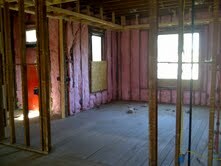 After the OSB I wrapped it with Tyvek, wow does Lowes like to advertise! 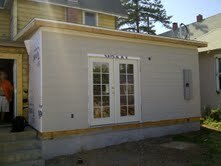 Its amazing how many local rehabbers I see that dont use house wrapping on their additions. 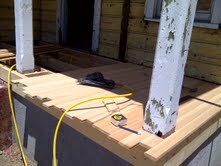 They’ll go straight over the OSB with the siding. For $88 bucks you cant go wrong and it really makes a difference on your electric bill and keeps the drafts out. 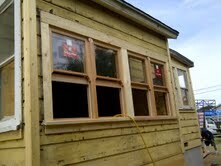 The windows arrived Friday and I got most of them in along with the back door so now it all locks up again. As you can also see I had a retaining wall built this week from CMU block under the perimeter of the new addition. There was such a deep below grade cavity from my excavation that this was necessary for correct drainage and to prevent water intrusion under the house. I’ll backfill the sides now and we’ll be good to go. Another example of how we are doing things right, some guys would have thrown down some plywood and backfilled. The back porch is really neat, cant wait to see everything now with the historic waterfall style #117 siding on it to match the house. Even though we were plagued with more rainout days this week, I still managed to get the exterior paint 95% complete. This is probably the most labor-intensive paint job I’ve done as it’s 6 colors and it entailed a lot of detail brushwork on the trims. So far I’ve put up over 60 gallons on the exterior! 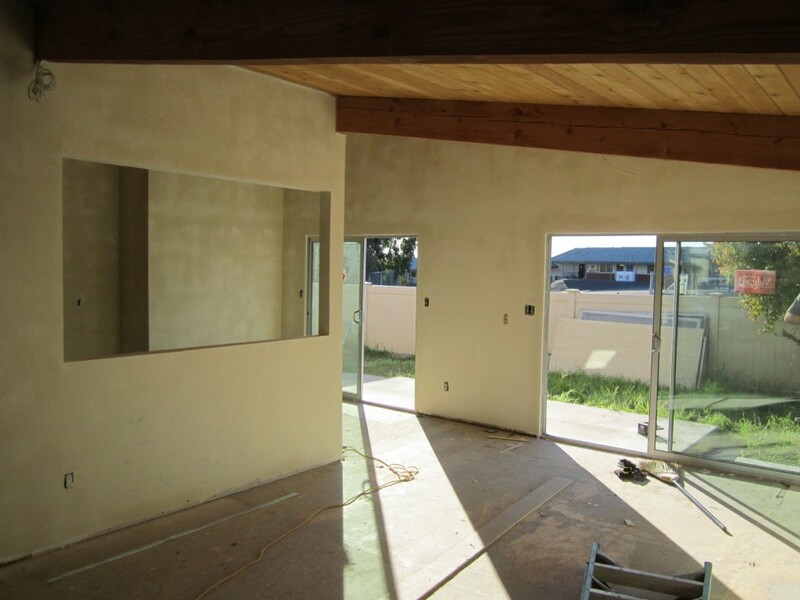 Keep in mind there’s a big 2-story guesthouse in the rear and I also sprayed 2 coats of everything including primer. As you read in my last post, I picked up a guy from Lowe’s parking lot to help me paint so it’s gone really fast. This guy is actually a great painter, he was making fun of me for using economy brushes so I broke down and bought a Purdy brush, man this thing practically paints by itself. Well worth the $14 bucks. 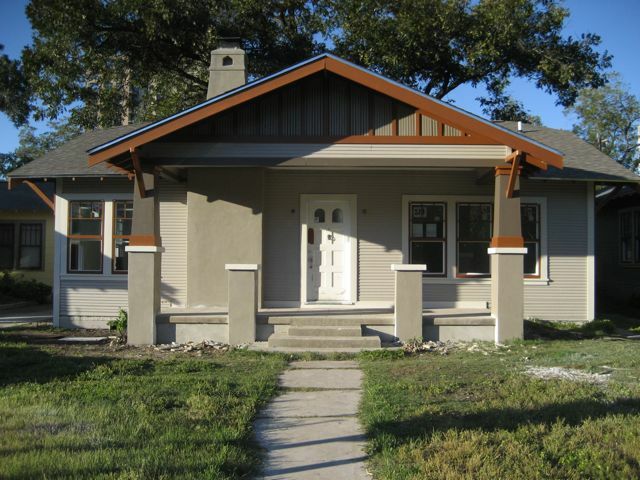 Because I was so happy with my historic craftsman style replica window screens on the last project, Hat Trick House, I decided to make them again for this house. I changed the design a bit so they wouldn’t look exactly the same, especially since the other house is right next door. I designed the center mullion placement to minimize the visability of the white vinyl and this new design came out great. I won’t stretch them with screen, although the future owner can if desired. My new double pane windows have screens already so these frames are basically just a cosmetic design feature that also plays an important part in the color blocking of our paint job. The historic replica screen hangers are also still available from Stanley. This extra little finishing touch really gives the house the historic look that I need for our neighborhood. There was a new BusinessWeek article this week that ranked San Antonio #1 for the top National economy. The measurements used were job growth, economic growth, employment and home prices. Texas seems to be the clear winner with San Antonio in the lead and five other metros in the top 10. While we are still seeing signs of the recession here and I’m always quick to say we are late to the party, this study shows that we are still fairing extremely well compared to the rest of the country. We’ve seen the housing market here drastically slow down in the last 2 years, but homes are still selling and people are still moving here everyday from other states so we have to be thankful that when coming from California, we picked a winner with San Antonio.